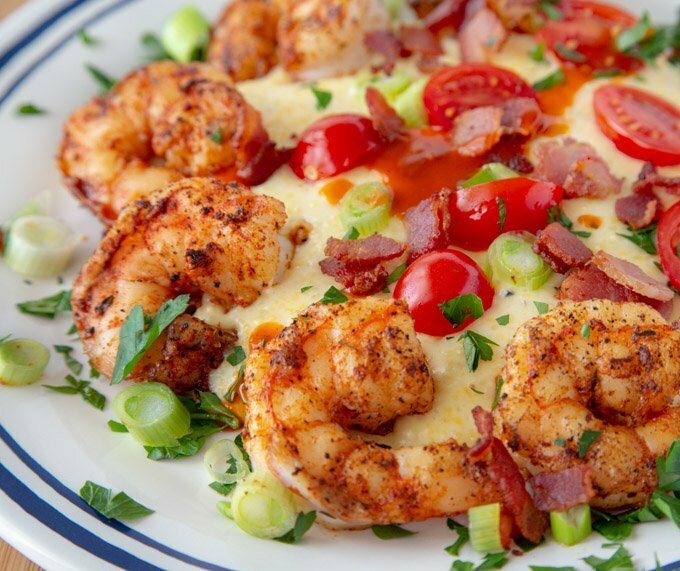 When you think of Southern Cuisine does Shrimp and Cheesy Grits come to mind? If it doesn't you need to try this easy to make authentic southern recipe. 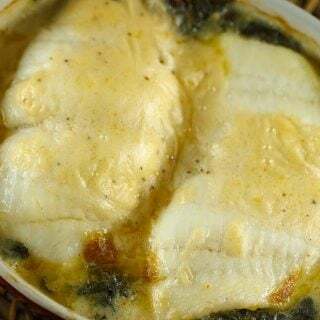 This Classic dish will soon become a family favorite! 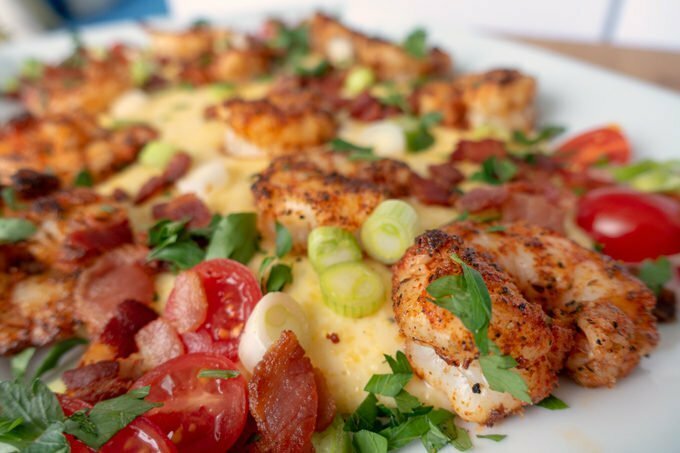 If you’re looking for a southern dish to wow your friends and family look no further than this southern classic Shrimp and Cheesy Grits. This post is sponsored by Cabot Creamery. The opinions, recipe, and images are 100% my own. There are many variations on this Southern classic. My version of Shrimp and Cheesy Grits is a fresher version using uncooked sweet cherry tomatoes adding another flavor dimension to the dish. I don’t rely on sauces to mask the individual flavors of the creamy cheesy grits and sweet gulf shrimp. Rather than onions, I use scallions with a milder flavor and a bit of a crunch. It’s very important to use good quality bacon, and I always look for “Humanely Raised” on the package. That’s the key to good bacon and will usually add other qualities you look for, Non-GMO, Vegetarian Fed and Pasture Raised. How we treat our food is important for more than the ethical reasons, it makes the food taste better. 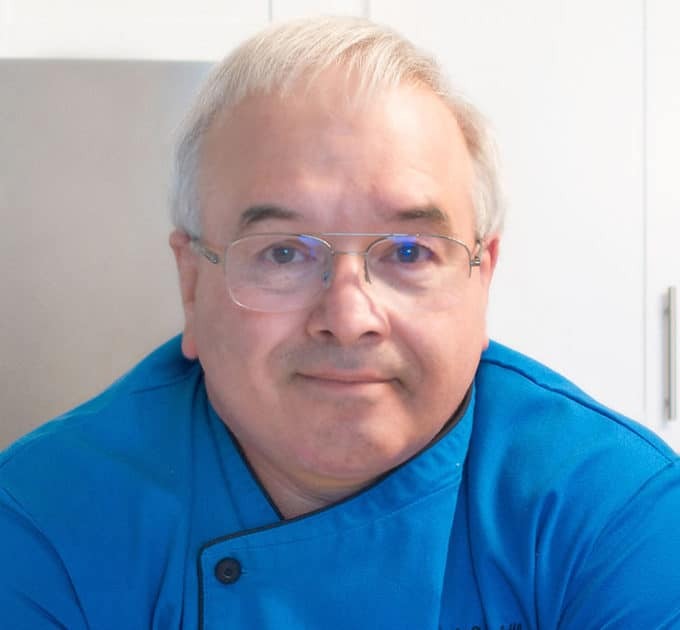 The first step in creating any dish in my kitchen is gathering the ingredients so that I know I have everything I need to prepare the dish. 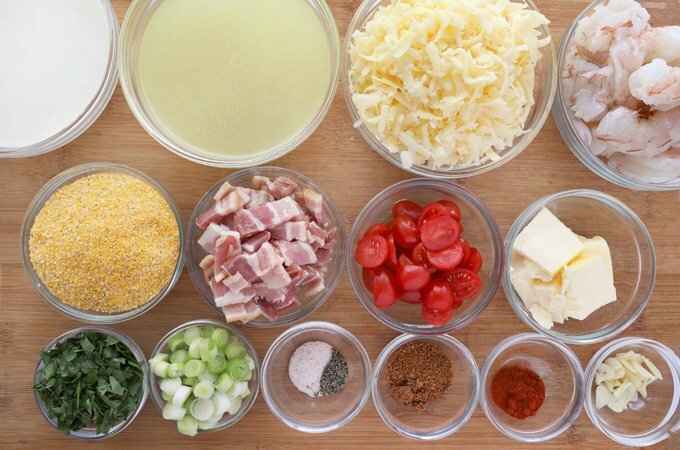 This is called a mise en place (everything in its place) and makes your cooking adventure easier and more enjoyable. Since our dish involves an ingredient many of you are familiar with I’ll explain a little bit about Grits before we start. I use Palmetto Farms Stone Ground Yellow Grits that I purchase on Amazon (this is an affiliate link). Grits are similar in texture to cream of wheat, but they are made from ground dried corn. 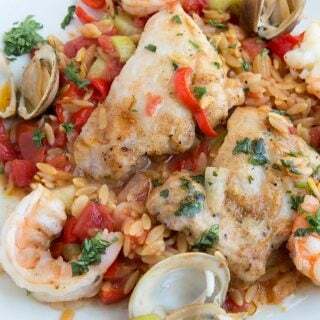 Because of their mild flavor, you can add just about any seasonings and ingredients to them, creating a southern classic or a family favorite. I saw these plates at one of my favorite home stores and had to pick up a few. Those blue rimmed white plates remind me of the classic restaurant dishes of the 20th century. Have you ever heard the term Blue Plate Special? It was an iconic phrase used by restaurants in the United States and Canada from the ’20s through the ’50s referring to a restaurant’s special dishes. What kind of Grits can I use in this recipe and other recipes? You can use any type of grits in your recipe that you have on hand or can find in your local grocer. Below you’ll find information on all the types of grits that are available. Stone-ground is my favorite variety of grits and can be found in yellow or white corn varieties as well as mixed together. These grits are made from whole, dried corn kernels that are coarsely ground in a mill. Stone ground grits cook up smooth, creamy, delicious, and full of a rich natural flavor. Not all grocery stores carry this type of grits because of a shortened shelf life but are the only grits I cook. I order my grits on Amazon. Hominy is made from corn kernels soaked in an alkali solution (lye or lime) to soften the tough pericarp (outer shell or hull). The pericarp is rinsed, then removed, and the corn kernels undergo further processing to make hominy. Quick and regular. These types of grits undergo processing, which involves removing the pericarp and germ (nutrient-rich embryo), so they have a longer shelf life. Regular versions are medium ground while quick are finely ground. This type of grits is much lower in nutritional value. Instant. This precooked, dehydrated version has had both the pericarp and germ removed. They’re widely available in grocery stores but are basically just a starchy food with little nutritional value. Grits are made from corn and are naturally gluten-free. This means they’re a suitable carb alternative for people who have to avoid gluten in their diet. What Liquid Should I Use to Make Grits? I like to use half milk and half chicken stock so the grits are creamier and have flavor from the stock. Use Vegetable stock or water to eliminate the chicken stock. Use all water adding 1/4 cup of heavy cream at the end. What Kind of Cheese Should I Use in my Cheesy Grits? 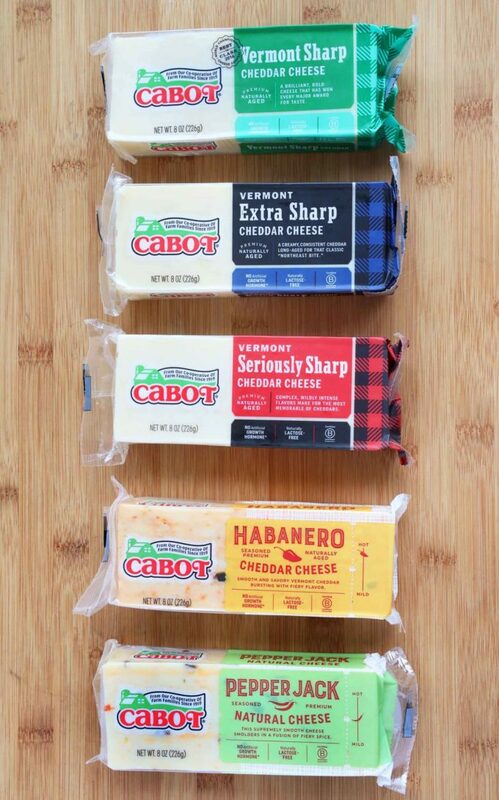 If you were to visit my kitchen on any given day you’ll find 3-4 varieties of Cabot Cheddar Cheese in my fridge. I generally use their regular Sharp Cheddar for my grits as this type of cheddar adds a delicious cheesy flavor to my grits. 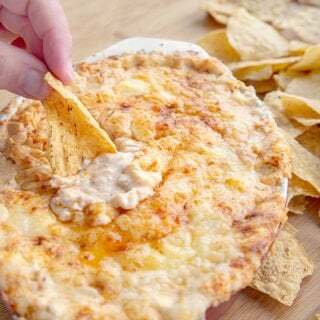 You can also use any of their other cheddars or specialties cheeses. 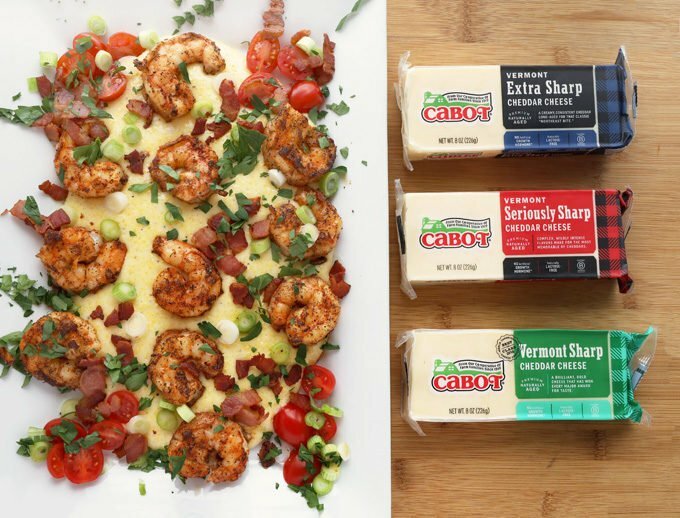 I was thinking about using Cabot Habanero Cheddar, but my wife is not a fan of heat….sigh. Bring the liquids to a boil then add the salt and grits. Bring the mixture back to a low boil whisking in the grits as it heats. When the grits are fully incorporated and have returned to a boil, cover the pot and turn the heat to simmer and cook until the grits are tender and creamy. Stir grits using a whisk occasionally during the cooking process. This will help the grits thicken. When the grits are done cooking add in the butter and cheddar cheese. Mix until fully incorporated. Use good quality smoked bacon. I buy humanely raised pork products and the bacon leaves little grease when cooked. Save some of the bacon grease to saute the shrimp. Buy American or Mexican Shrimp from the Gulf of Mexico or the Pacific Ocean. Shrimp from the Atlantic coast of the US are also acceptable. Don’t buy freshwater shrimp or farm-raised shrimp. Avoid shrimp from Asia, India or any the surrounding areas. Dredge the shrimp in the seasonings before cooking. This will add some great color to the cooked shrimp. Add the shrimp to a hot pan searing on each side for about one to two minutes depending upon their size. Add chicken broth and milk, to a 2-quart saucepan and bring to a gentle boil. Add a pinch of salt and the grits, whisking together. Bring back to a low boil as you continue to stir. 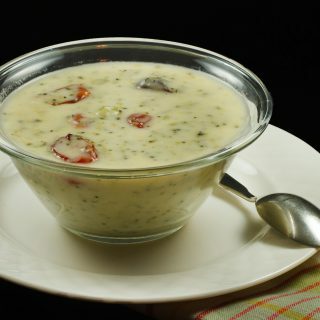 Reduce heat to low, Cover grits and continue simmer for20-25 minutes or until grits are soft and creamy and fully cooked. While grits are cooking, cook the bacon strips until crispy. Set aside and allow to fully drain on a paper towel. Save one to two tablespoons of the bacon grease to cook the shrimp in. When grits are finished cooking, remove from heat and stir in the butter and shredded Cabot cheddar cheese, mixing until fully incorporated. Season to taste with sea salt and black pepper. Keep covered until ready to serve. Stir grits well before serving. Heat a large skillet over medium heat. When hot add 1-2 tablespoons of the bacon grease. Dredge the shrimp in the combined smoked paprika and cajun seasonings. Add the shrimp and sliced garlic to the pan cooking the shrimp on each side for one to two minutes depending upon the size of the shrimp. 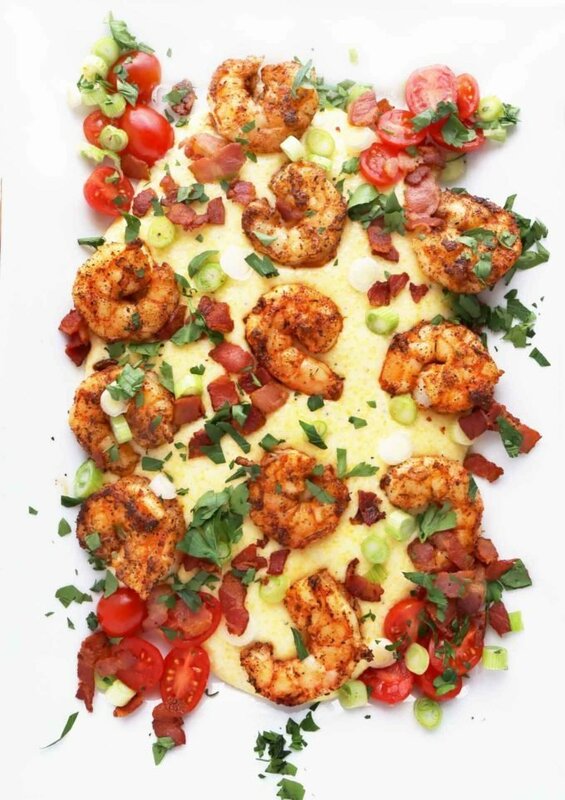 When the shrimp are done, add a layer of cheesy grits to a serving dish or individual plates or bowls. Top with seared seasoned shrimp and garnish with bacon, tomato halves, scallions and parsley. *Grits of your choice can be substituted. Follow cooking directions on package. **Prepared shrimp should be peeled, deveined, rinsed in cold water and patted dry with paper towels. I was looking for an awesome recipe for the whole family and I stumbled on this article. 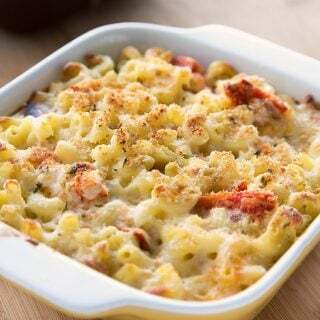 I read and followed the instructions carefully and I made this shrimp cheesy grit recipe deliciously! Every member of my family is so happy! Thanks for this! you are very welcome Kate! Thanks for the comment and great review!! 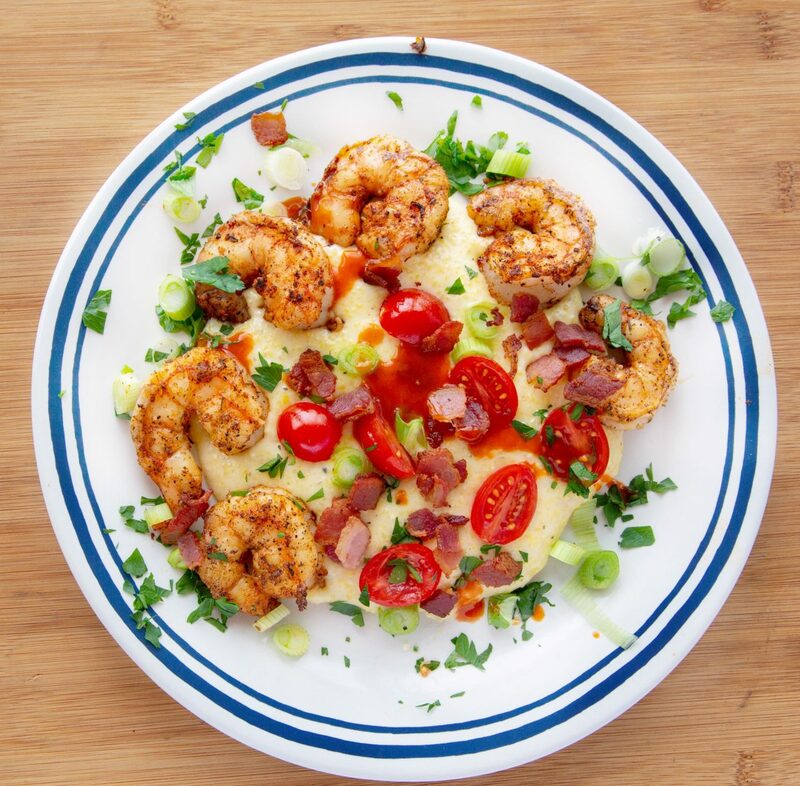 There is nothing more southern than grits and shrimp. Yum!! I love cheese grits with fried fish too. 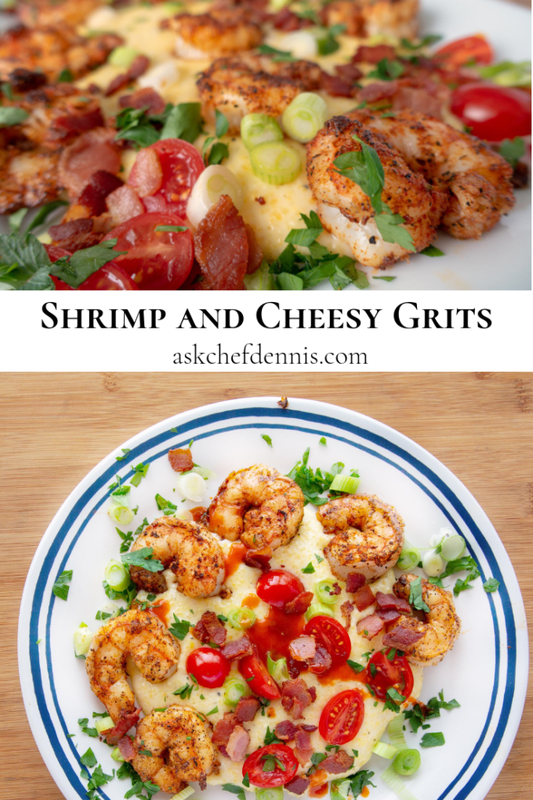 Your recipe for grits is spot on and I love your shrimp recipe. 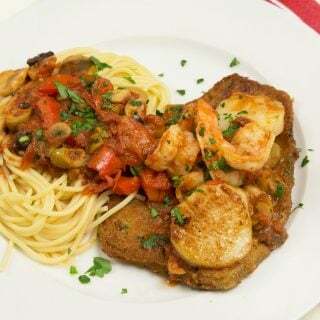 What a great hearty recipe. This would go over really well in my house! Can’t wait to make it. My husband would LOVE this. I need to surprise him and make it for him! This is a great combination! I love how pretty and delicious this looks. Yum! I love shrimp and cheesy grits! I’ll have to try this recipe, it looks fantastic. The diner next to my office has blue plate specials. We just were talking about what that actually meant or referred to. I have an entire family that would absolutely gob of these up. It just reminds me of the south and everything it represents. I’m going to learn how to make gourmet dinner from you! Thank you for sharing your recipe. This recipe looks so savory. I love a good shrimp and grits recipe. Especially with cheesy grits. Looking forward to going this recipe a try. I have never had cheese grits so hoping I will like them more than plain grits. They really do look delicious. Erm what is not to love about this recipe! I could 100% see my making this for dinner tonight if I had everything already – I am going to have to check that out. Well heck yes, I am all about cheese. I’d leave out the shrimp in mine since I don’t care for seafood. But cheese? Yes!